I am so behind with blogging since getting back from Scotland. I really want to write about what we got up to, and the amazing house we stayed in, but I have come down with a massive case of the come-downs. 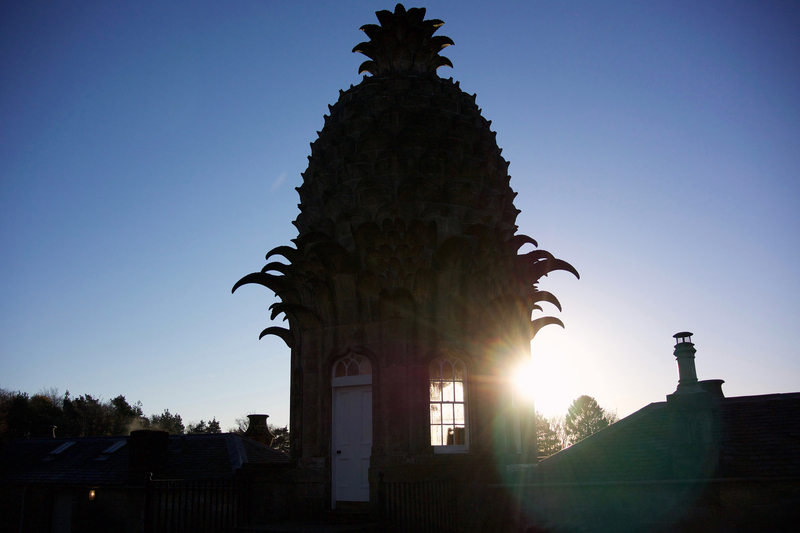 Living in the real world in England is just not as fun as living in a pineapple in Scotland. Yes, that’s right, a pineapple. We’re now up to our fourth Landmark Trust property, and I think this one is their most iconic building. 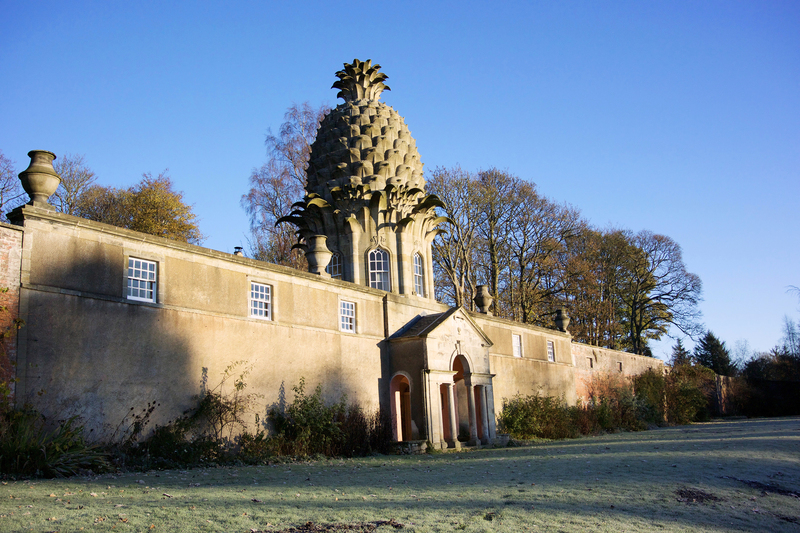 The Pineapple in Dunmore was built by (essentially) a crazy rich man, who wanted to boast about how rich he was by sticking a massive pineapple on his summer house. Lord Dunmore was a mad genius. It goes without saying that the Landmark trust have restored the property to an excellent standard, with a cosy living room, lovely kitchen, two bedrooms and a nice bathroom. You did have to go outside to get to the bed/bathroom ‘wing’ of the house, but that didn’t bother us too much. In all honesty though, you don’t stay here for the interior. 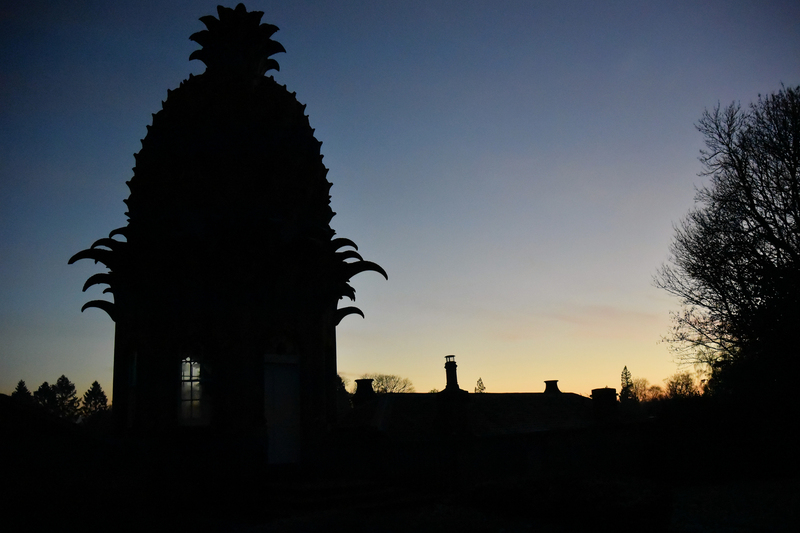 You stay here because you want to sleep underneath a bloody massive pineapple. We spent ages out the front, out the back; photographing during the day, at night – it was utterly freezing, but how could you not want to photograph this beauty from every angle? The front gardens were open to the public – I knew this, but wasn’t quite prepared for a dog walker to catch me opening the curtains in my PJs. We could have had it worse though – the log book tells of ramblers making all kinds of demands on the residents! 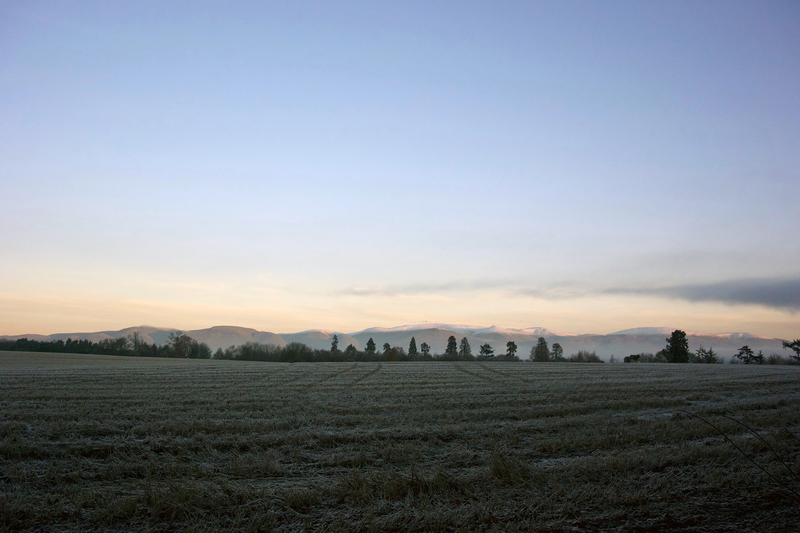 As the back of the house was a farmers field, and beautiful snow-capped mountains. It was so picturesque, it was enough to make you weep. First of all, an apology for the insane amount of photos that now follows. This past week was spent with my In-Laws in the very south west corner of Wales at a stunning Landmark Trust property – the West Blockhouse. This is the third Landmark Trust place Husband and I have stayed at, although it was actually the first property I ever saw of theirs many years ago. It’s just taken us a while to book here. The blockhouse was built in the 1850s to protect the bay from enemy ships. I’m paraphrasing, but the LMT website has all the history you’d ever need on the place. Just over 40 men were squished into the fort, but fortunately for us, there were only 6 adults, a toddler, and a dog so we lived in luxury for the week. The LMT have done an amazing job at restoring it, with comfy bedrooms, a snug living room, and very clean bathrooms. The drawbridge leads directly into the first floor, and the main living space. The ground floor was an unfinished basement area, with one of the rooms containing a table tennis table. I didn’t get a chance to play! The outside space was on the roof, and out back in the grassy garden. The one criticism I had of the fort was that there was nothing to sit on in the back garden. There were deckchairs but they were at the top of the spiral staircase for the roof – it was too awkward to try to bring them downstairs. That’s possibly one of the most ridiculous statements I’ve ever made. 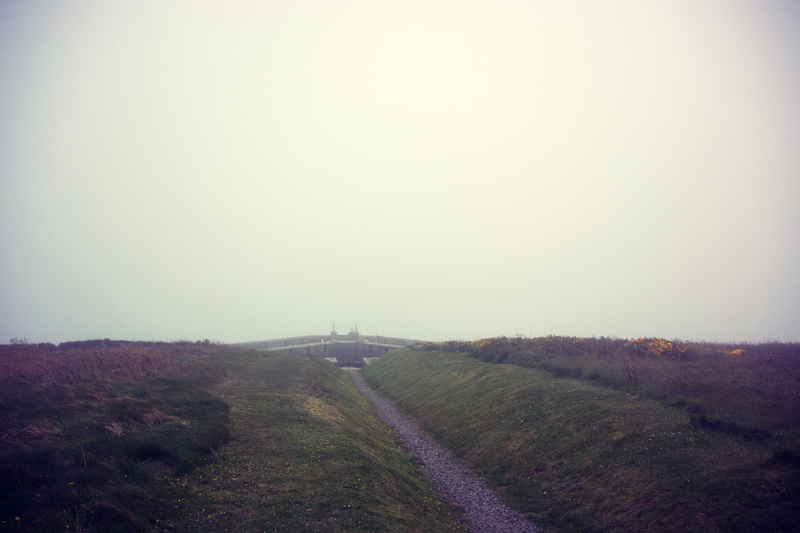 As we got closer to the fort, the fog rolled in from the sea, so this was the first sighting of it, all misty and dramatic. The fog didn’t stay for too long, but did make for dramatic photos. 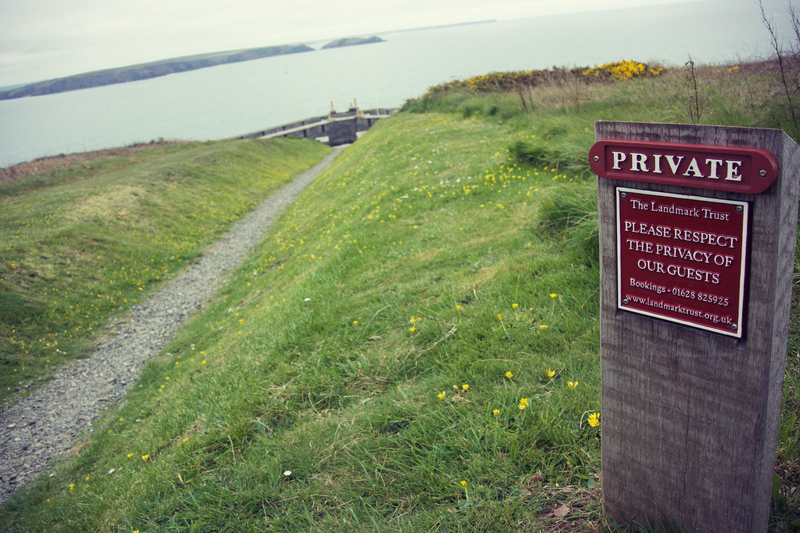 Believe it or not, the sea is just behind the fort at the end of the pathway. The second part of our mini-break/week holiday was spent in a tiny hamlet just outside of Bude called Coombe. The Landmark Trust owns all the properties in the hamlet, including the one which we would call home for the next five days – Coombe Corner. We stayed at a Landmark Trust place a couple of years ago (the epic Castle of Park) so our expectations were high. Perhaps a little too high. I won’t go into the problems that we had with the cottage as it seems unfair to moan, especially because the Landmark Trust have apologised to us. It wasn’t a disaster by any means, but it certainly didn’t make an impact on us like the Castle of Park did (where the bath tub there still features in my top five baths ever*). Anyway, we got into the house just before 5 as the sun was setting over the valley and we settled in to having no TV, Wi-Fi, or even phone signal. It was a little unsettling to be alone in the middle of nowhere without a phone signal so we tried not to think about it or have an accident (nearest signal was a mile down the road at the beach). I don’t think we got used to that the entire week, but we did have some films/TV shows on Husband’s laptop to distract us from the solitude. We didn’t have a great night’s sleep – we were both awake at 4am so took the opportunity for a bit of star gazing through the living room window which was pretty spectacular. 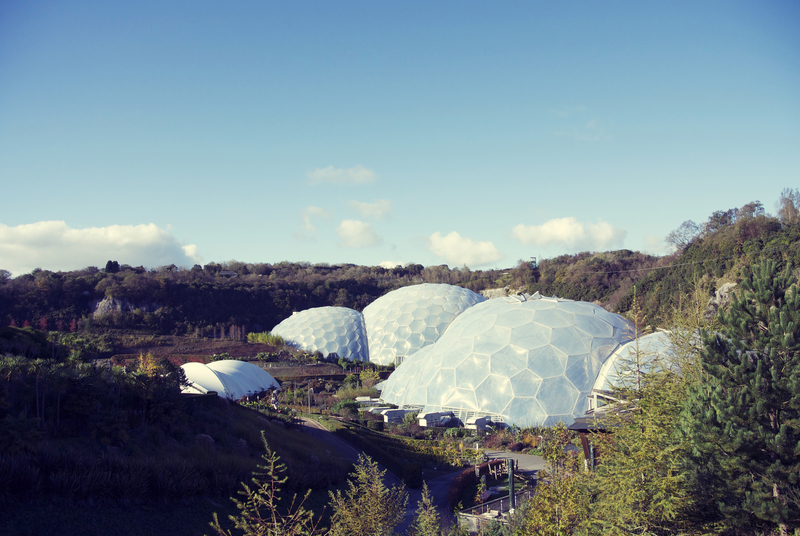 We got up properly a couple of hours later and decided to drive the hour or so down to the Eden Project. We visited on such a great day – it was bright and sunny and barely anyone was there. We didn’t quite have the biomes to ourselves, but it was still pretty much crowd free. We got lunch from the Eden Kitchen and sat outside – I had a really delicious coq au vin and Husband had steak and ale pie. So yummy. We had a quick wander around The Core before buying bamboo socks and popcorn in the shop (although I could have bought a lot more) and got back to our car for our next stop. A stop I will regret forever. When I was eight, I went on holiday with my grandparents and great-aunt to Cornwall. I remember quite a lot of that trip, and in particular, I remember visiting a shop called Trago Mills and getting a teddy and some roller skates. It has lived on in my memory as an amazing place, so I thought it might be fun to revisit that store. This is despite my Mum saying to me a couple of days previously “don’t go there, it’s a hellhole”. Well, it was a hellhole. Unfortunately, eight year old me wasn’t particularly political minded so didn’t realise that it was run by a right-wing nutcase. I had repressed how awful the shop is, with anti-EU signs and statues outside. No, really. We would have walked straight out again, but we got lost. I was quite terrified that we would end up having to live there. Fortunately, we found the exit and ran to our car, not looking back once. NEVER AGAIN. We quickly popped into a normal supermarket (for some sanity) before getting back to the cottage. Snuggling up together again in front of the laptop, we watched a film before going to bed. Honourable mention goes to the bath at my in-law’s house.